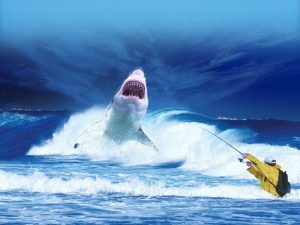 Recent Shark Attacks On Humans: What Is The Real Risk? - We Love Sharks! Recent Shark Attacks On Humans: What Is The Real Risk? - We Love Sharks! Recent Shark Attacks On Humans: What Is The Real Risk? Each year, there are reports of approximately 150 shark attacks on humans worldwide. Of these attacks, between 80 and 90 are considered to be unprovoked. These are incidents where people were attacked without any prior provocation of the shark in its natural habitat. Although relatively rare on a global scale, unprovoked attacks are the stuff of tourists’ nightmares. So, what is the real risk of being attacked by a shark while you’re out snorkeling on the reef? Let’s take a look at some recent shark attacks to find out more. A Texas man was attacked by a shark while boogie boarding in chest-deep water. Out of the blue, the shark grabbed and bit his leg. Though he managed to set himself free by ripping his leg out of the shark’s mouth, his leg was torn and punctured in several places. Usually, shark attacks tend to be unexpected and occur in shallow waters. It appears most shark attacks are not deliberate. After the bite, sharks realize that they have mistaken the human for a sea mammal and they swim away. That would explain why they tend to bite only once. According to information from National Geographic, most shark attacks occur less than 100 feet from the shore and are more prevalent around popular beaches. In September 2016, a 58-year-old woman was bitten by a shark while exercising only 90 to 120 feet (27 to 37 m.) off the coast of Maui, Hawaii. Shark attacks are known to increase in the months of September and October. This may be attributed to the fact that female tiger sharks give birth near the coast around this time and then search for food to replenish their energy. Surfers account for a significant percentage of all attacks. If you’re an avid surfer, it’s probably best to remember that sharks tend to feed at dawn and dusk. It’s best to stay away from the ocean at these times. In March 2016, a 22-year-old man was attacked at 7:15 p.m. while surfing off the coast of Bombo Beach on Australia’s Eastern Coast. He survived but required a blood transfusion due to severe blood loss. Some vacation spots are more prone to shark attacks than others. New Smyrna Beach in Florida, for instance, is considered the shark attack capital of the world: in 2016 alone, over 10 shark attacks took place there. Within just two days in October, they were two separate confirmed attacks on surfers. Because of the murky water and a large amount of bait fish, spots along the coast of New Smyrna Beach have proven to be prime locations for shark visits. Due to this fact, there is a legend that anyone who has swum here has been within 10 feet of a shark. How Can You Reduce The Risk Of Shark Attacks? Shark attacks tend to be unpredictable and unprovoked, making them worrisome for vacationers worldwide. However, if you can take some general safety precautions, the likelihood of experiencing one is minimal. minimize swimming in areas with large amount of bait fish. Shark attacks are rare and, if they do occur, they are usually not fatal. Furthermore, it’s useful to keep in mind that humans kill two million sharks for every person that is killed by a shark. Does The Megalodon Shark Still Exist?